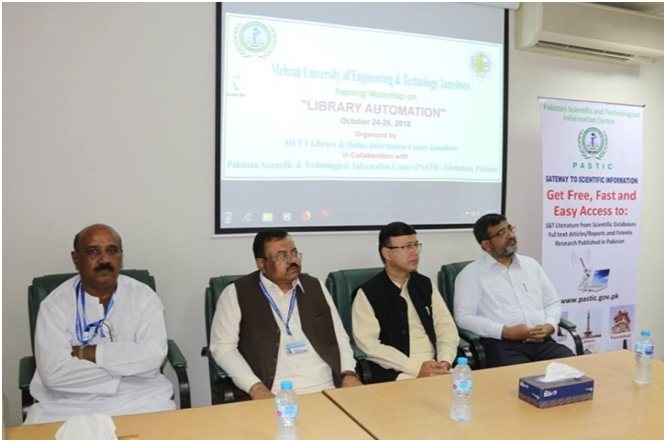 PASTIC National Centre, Islamabad and PASTIC Sub Centre Karachi organized a three-day Training Workshop on Library Automation by using Koha ILS Package on October 24-26, 2018 at the Mehran University of Engineering & Technology, Jamshoro, in collaboration with MUET Library & Online Information Centre Jamshoro. Total 34 Participants from different universities and institutions of the region, attended the training. The Resource Persons of the training were Mr. Syed Habib Akhter Jafri, Principal Librarian, and Mr. Fahad Obaid, DCA, PASTIC. 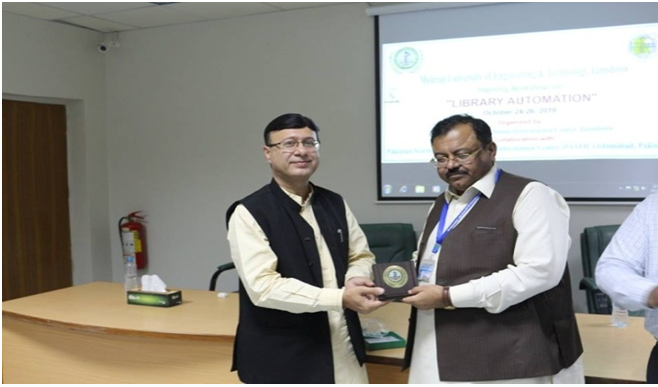 Prof. Dr. Muhammad Akram Sheikh D.G PASTIC presented Momento to Prof. Dr. Mohammad Aslam Uqaili, V.C MUET during training Workshop on Library Automation by Using Koha ILS Package. The workshop was organized under the PASTIC Development Project, "Modernization of PASTIC Library for Effective Resource Sharing".